Our last day at Ayers Rock was possibly the best day, and if I could do things over I think I’d do it on our first day instead of our last. 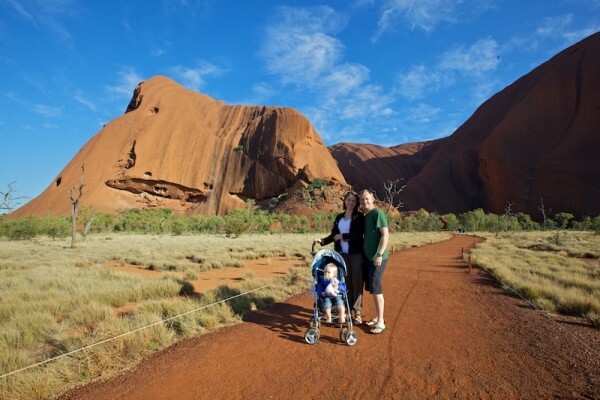 On our last day, we actually went to Uluru (Ayers Rock) for the morning, and I ended up wishing we had about 6 more days to spend just exploring it. We were up and at ’em before dawn again, while the golden full moon was still well up in the sky. We drove over to Uluru to watch sunrise. It’s funny because there is just SO MUCH space out there, that we felt almost completely alone for the whole 30-ish minutes it took to get there, and even while parking. Then we noticed that there were about a dozen enormous drowning-bee-like tour busses parked in the lot. Then we got out and headed for the sunrise viewing spot (the name of which, I might add, was in the local language and must have had over 30 letters all jumbled together in one word: I have NO idea how one should attempt to pronounce it!). And suddenly we realized there was a mass of a hundred or more people up on the viewing platform! Naomi and I parted ways with Daniel so he could get the best shots and we could just piddle along. Naomi again made a beeline for the nearest place to lie down in the dirt and play, and this meant I could enjoy the sunrise. It was exquisite. 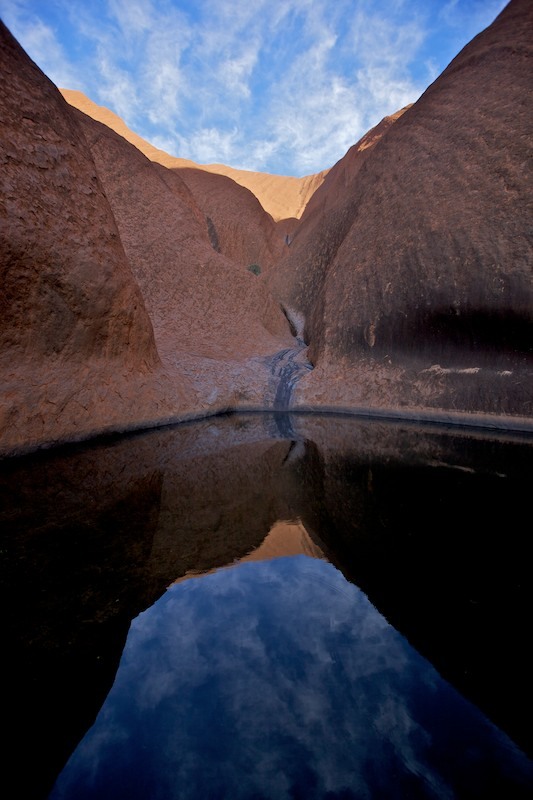 The viewpoint actually directs your gaze to Uluru, rather than to the sunrise, so the sunrise is behind you. The resulting view is incredible. 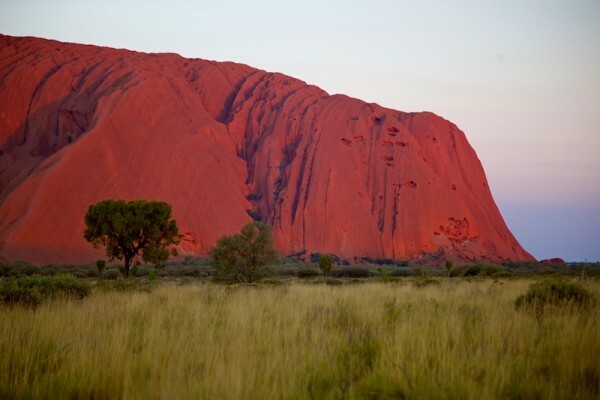 Uluru is made of the same red minerals as the surrounding dirt, and it practically glows in the already-red sunrise. It was really breathtaking. Plus, this was my first time really getting a good look at the rock at all, because on the first two days I’d only seen it from a distance. As we drove around it to the sunrise viewing spot, I’d been really impressed at what varied topography it has. In most pictures I’d seen, it looks like a pretty flat chunk of rock – kind of like an enormous fluffy pancake that God accidentally dropped in the middle of the Outback. But driving around it you realize that its other side has huge divots and arms spreading out which look more mountainous than pancake-like. In addition, the thing is just huge. There’s really no way to convey how this impresses you when you’re not standing there looking at it, but it really impressed me. This is actually the moonrise, caught by Daniel the night before. 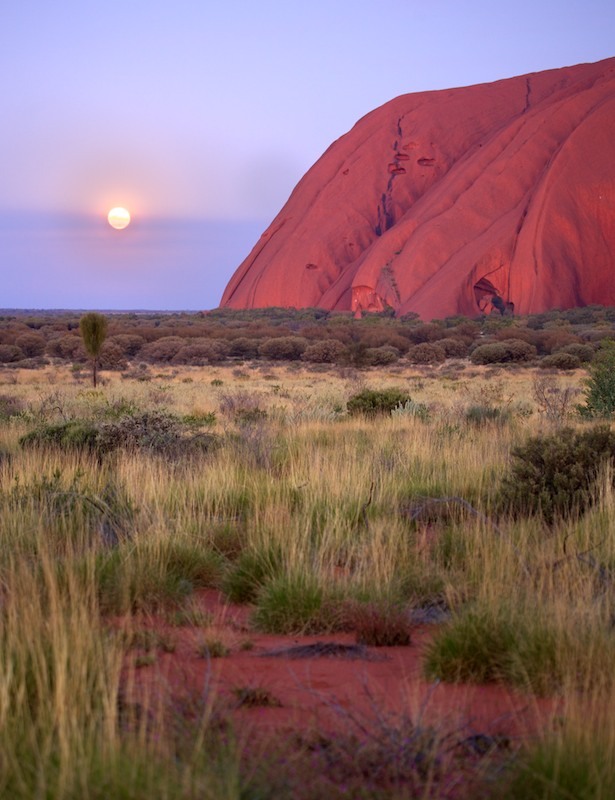 On this particular morning, since last night had been full moon, this meant that the gorgeous globe of a moon was still hanging just above the horizon beside Uluru, sinking below the horizon as the sun peeked over. It was really lovely. Actually I noticed that the moon was still visible for about 5 minutes after the blood red sun had made its emergence, which I think means there was lots of haze or something? It kind of put a damper on the experience to be surrounded by the massive crowd, as everyone has their own way of enjoying something like this, and many of them were enjoying this much more loudly than I would have preferred. But, with a toddler, I’m sure I was louder than some of them would have preferred so I guess that’s just life. There was a beautiful rest area near the viewing platform (identical to the one at the trailhead for the previous day’s hike through the Olgas, complete with even more awesome hand-carved benches), and this was actually where Naomi planted herself – in a garden right beside it. As the crowd began to thin shortly after sunrise, and Naomi continued her fascination with the dirt, she acquired an enormous international fan club. One problem we have actually when we travel is that a lot of people take her picture without asking, especially East Asian tourists (I think they tend to be more camera-happy in general, and also I think they’re more struck by her fair skin and blonde hair). I’ve struggled to know how to respond to this, since I don’t really like the idea of my child’s face being taken away to who-knows-where, to be used in who-knows-what-manner, but on the other hand we put her picture up online so that’s sort of exposing ourselves to the same thing. Anyway, thankfully this time she mostly had her face down by the dirt, scrutinizing it and getting her nose all smudged with red dust, so I don’t think anyone was taking pictures of her face. After awhile Daniel met up with us again. We got some family shots and then left the viewpoint to get up closer to the rock. 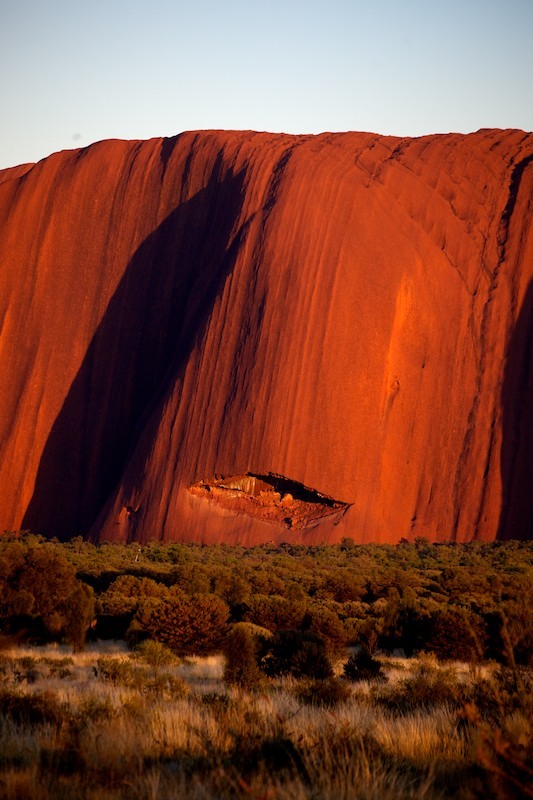 Uluru is actually almost 6 miles in circumference, and about a mile and a half long, so you can spend a lot of time looking at it from various angles. In retrospect, I wish we’d taken one more day to do the hike that encircles it from ground level. But, being short on time, we drove around it instead, stopping at a couple different points. The first stop we made, and the longest, was at a spot known as the watering hole. It’s located on the particularly bumpy side of the rock, and has a 1-km trail leading up to it and partly into the folds of the rock. There were several neat spots along the way in to the watering hole, like a cave where the Aṉangu (the tribe of Aborigines in that region) used to sleep, and another little cove absolutely covered with multi-colored hand paintings. I enjoyed that. There was also an area a bit further away from the rock, where printed signs told the Aṉangu’s traditional story of how Uluru came to be, while a recording played the sound of some Aṉangu people singing the story in their own language, and someone translating it. I’m not particularly interested in myths, to be honest, but Naomi insisted on staying by the “songs” as long as I would let her and was very upset when we left. The style of music reminded me a lot of the music of the Indonesian people group in which Daniel was raised (and the two peoples actually look almost identical, and are almost certainly distant relatives of each other). Eventually we made our way to the watering hole. Unfortunately a tour group was already there, which added to my sense of dismay at how overrun by tourism the spot seemed to be (especially since animals still use the spot for water). On the other hand, it meant we learned more about the spot than we otherwise would have, which was nice. A video camera was set up there, where the park staff monitor how many animals still rely on the spot for water, and which kinds. Interestingly, the main pest they have in that area is the camel, which is not native to Australia but was brought by Europeans and released into the wild. Since camels can drink something like 25 gallons of water in one sitting, they can potentially devastate a drinking spot like this for other native animals. We left that area and drove all the way around the rock after that. 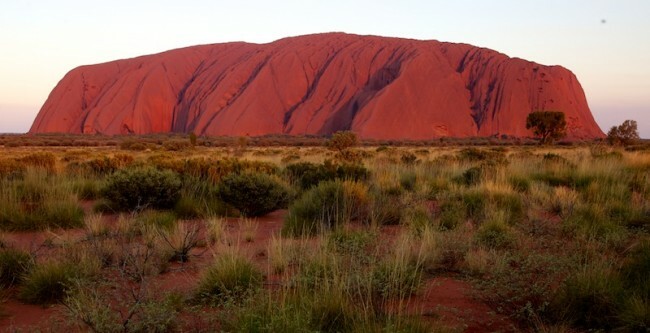 I must say, I think Uluru is one of the most beautiful things I’ve ever seen in my entire life. I could spend a really long time just contemplating it, with all its pits and caves and patterned striations and rivulets of black lichen. Like the Sydney Opera House (but better of course), it’s a different rock from every angle. I find it fascinating that even though this rock looks absolutely enormous, the majority of it lies underground. Also, what the heck is one rock doing staying that big? Why hasn’t it broken down like other rocks? Does it take steroids or something? Is it protected by an invisible force field? Technically it is considered an “inselberg,” which is an island mountain left after the other mountains around it eroded away. The fact that it is one completely homogenous rock with no joints, means there is no scree which just adds to its elegant beauty. After that we were approaching check-out time at the hotel, so we wistfully left Uluru and drove back. Then it was onward to the tiny airport where we had about a 20-minute wait. Unfortunately, Naomi conked out as we pulled into the airport parking lot, which was still about an hour before take-off (with a 3-hour flight at midday, we were obviously hoping her nap could overlap with that). We roused her and hoped she could stretch it another hour and then sleep on the flight. No such luck. She became extremely hyper in the airport, and although we tried lulling her to sleep a few times over the course of the flight, this only seemed to let her reenergize for new bursts of frenzy. Love it when that happens. When we finallyfinally arrived in Sydney, we remembered that a Qantas strike had been going on there all day, including the ground crew that transfers the luggage off the planes. Sweet. As we made our way to the luggage carousel, we saw tons of really long lines waiting to board their Qantas flights, with apologetic flight crews announcing that the rest of the crew was having to clean the plane which was taking longer, and that there were no meals (catering staff was also striking). Thankfully the strike was scheduled to end about a half hour after we landed, so we did get our luggage eventually. Then we got a taxi (whereupon yet another taxi driver tried to convince me that children over one year of age do not require a car seat – what is up with these taxi drivers? As if I’m going to buy that!) About 30 seconds after we got Naomi strapped into her car seat, she conked out again, this time for good. It was only about 5 pm, but after her long napless day, she stayed asleep for the rest of the night even after transferring her into her own little bed at home. I was surprised at how relieved I felt to come back to Sydney. This whole trip has made me realize how ready I am to give traveling a rest for awhile (of course, this is only one half of Daniel + Katie talking… :) ). I hadn’t expected to feel that our travels were “over” until after we were back in California, but getting back to our apartment here in Sydney actually did feel really restful and familiar.